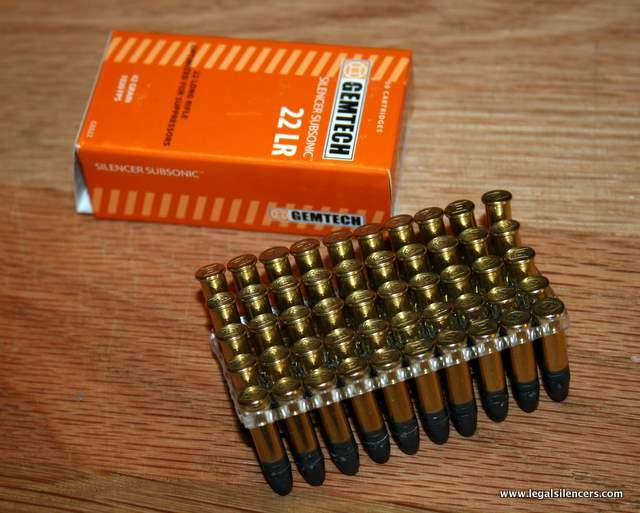 At Shot Show 2011, Gemtech released their new 42 grain subsonic ammunition to the general public. The ammunition was designed to be harder hitting, cleaner burning, and more consistent (thus more accurate). 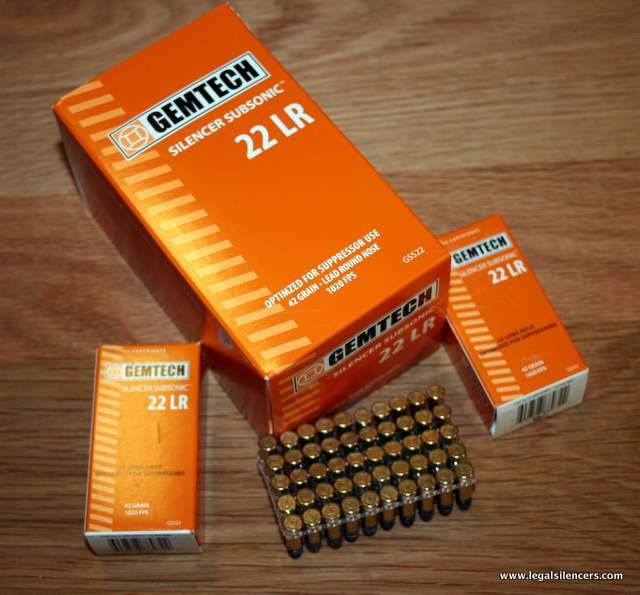 It was rumored that the ammunition is made for Gemtech by CCI/ATK as the packaging was very similar. Regardless of where it was made and by who, the proof is always in the pudding. 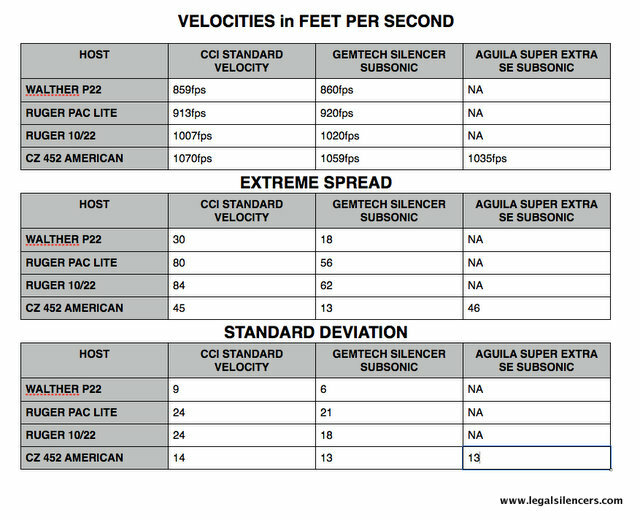 We wanted to compare this new ammunition to the gold standard in silencer testing, CCI Standard Velocity. CCI Standard Velocity is published to fly at 1,070 feet per second. The Gemtech ammo is designed to fly at 1,020 feet per second. Silencer enthusiasts have one big concern when it comes to bullet flight speed; the speed of sound. What a lot of people don’t know is the speed of sound changes with temperature and elevation. What is subsonic in Florida at 100 degrees might go supersonic at 30 degrees in Wisconsin. Therefore we need a consistently subsonic round in the majority of operating environments. Anyone who has discharged a silenced 22LR only to hear the loud ballistic crack of the bullet tearing downrange can tell you how disappointing supersonic 22LR ammunition can be. Just a word of caution about published velocities. 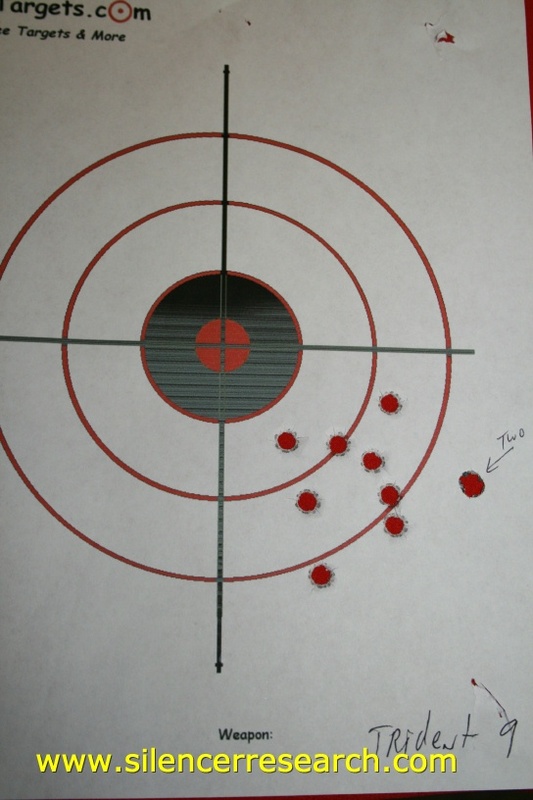 SAAMI specs on 22LR velocities are from a 24″ barrel. Silencer people seldom use such excessive barrel lengths anymore. Research has shown that bullets in these longer barrels can actually allow a bullet begin its forced exit from a long barrel, reach a velocity beyond the published number on the box and actually slow down before exiting the crown. That means when a gunsmith cuts off a 22LR barrel to 16.5″ the bullet may actually exceed the published numbers. Since we flirt with supersonic in an effort to extract maximum hitting power from our suppressed shots, we can get a loud trans/supersonic shot. Chamber dimensions also play a role in actual bullet speeds. Very tight match grade chambers can increase velocities as opposed to loose sporting chambers in semi-autos. 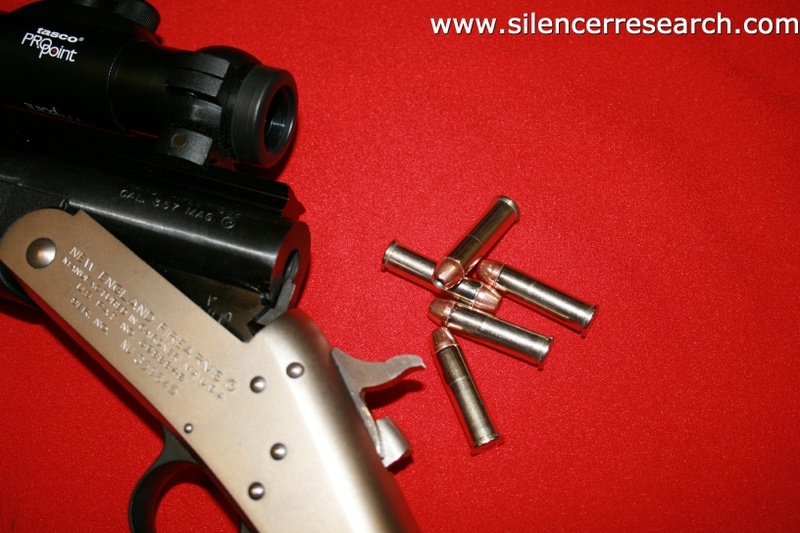 Finding a good quality 22LR ammo for silencer affectionados that works reliably in across many platforms has been somewhat difficult in the past. Does the Gemtech ammo fit the bill? ?…read on. 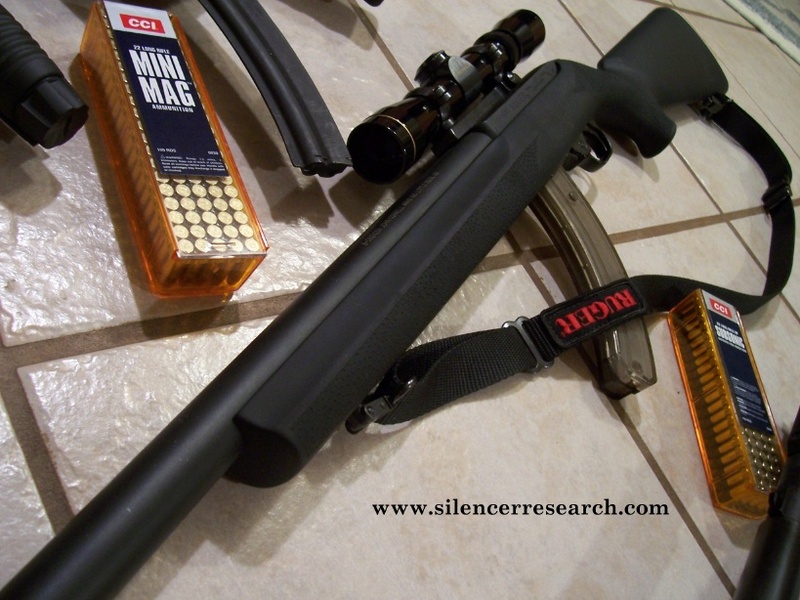 In order to find out how the new Gemtech Silencer Subsonic performs, we did several tests. First we tested noise reduction at the MIL STD 1474D Reference Location and at the left ear (another MIL STD 1474D location) using two calibrated Bruel and Kjaer 2209s equipped with B&K 4136 transducers and calibrated with the 4220 piston phone. 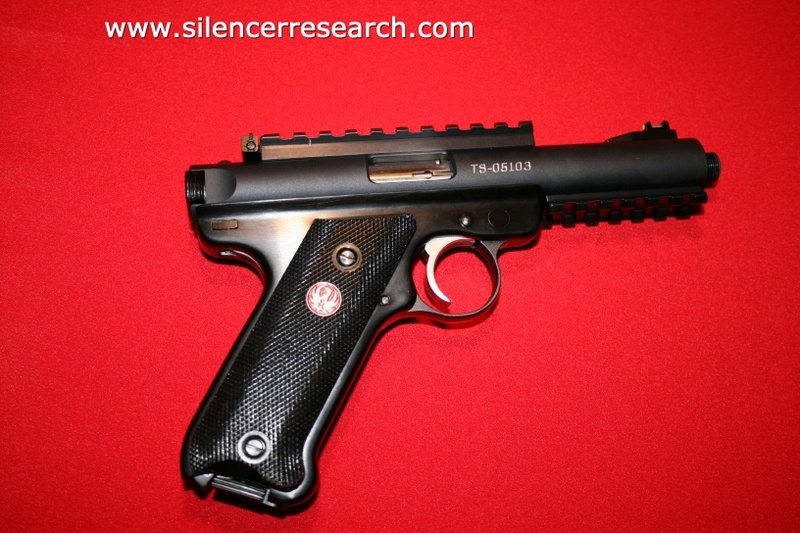 This is one of two systems acceptable for testing silencers to the military standards set forth in MIL STD 1474D. The other is a Larson Davis 800B. Next we tested velocities with a chronograph from Shooting Chrony for each weapon and ammo type. Finally we tested for accuracy. The test was conducted using the Walther P22, the Ruger MKIII with Tactical Solutions Pac Lite 4.5″ barreled upper, the Ruger 10/22, and the CZ 452 American. Accuracy tests were done with the rifles. Remember that it takes one dB of difference for a well trained human ear to detect a discernible difference in sound pressure levels. In most cases, these results show no real differences between these two ammo types. 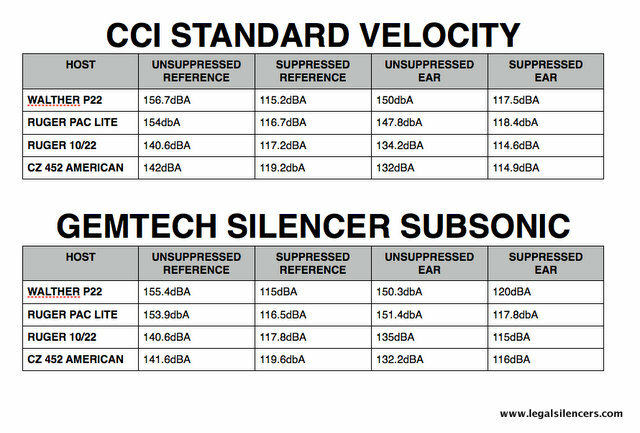 In other words, the Gemtech Silencer Subsonic ammunition isn’t louder or quieter than CCI Standard Velocity. Ear testing is very subjective and in my opinion, not very reliable since silencer impulse noise is VERY directional. The CZ 452 American was also tested with Aguila Super Extra 38 Grain ammunition, as its typically subsonic in that particular host. The numbers it generated were 118dBA at the reference and 115dBA at the ear. Since the sound testing didn’t detect any significant differences, we moved on to chronograph results. Here we revert back to our concerns with velocities out of rifles. We simply cannot have transsonic shots from a suppressed 22 rifle as it very nearly defeats the purpose of using the silencer. 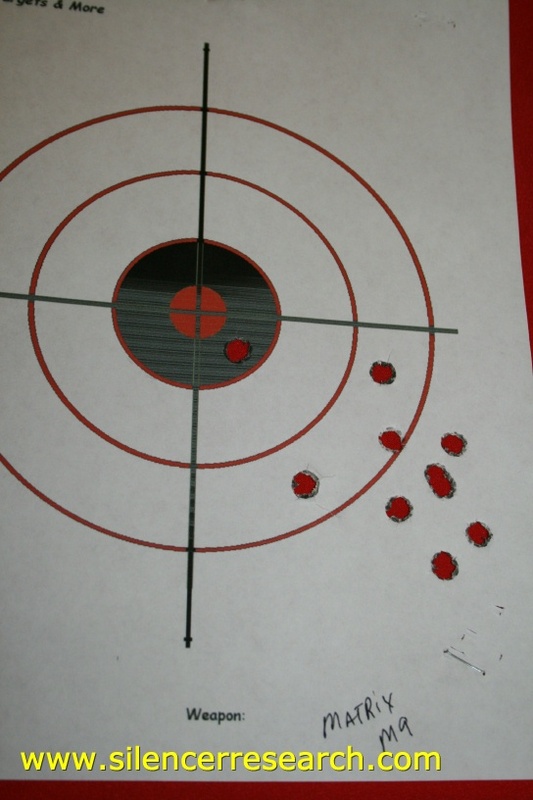 The Ruger 10/22 performed quite well with both CCI Standard Velocity and the Gemtech ammo. In fact the Gemtech ammo from the 16.5″ threaded 10/22 barrel was spot on at the published 1,020 feet per second with the ten shot average. The extreme spread (the difference between the fastest bullet and the slowest bullet in the shot string) was smaller with the Gemtech ammo. The CZ 452 using CCI had one shot at 1094 feet per second as the fastest shot, whereas the Gemtech ammo had its fastest shot at 1,075 with this host. Either way, neither ammo type can be counted on to remain subsonic in all temperatures. That is why we typically use the Aguila in this host, as it’s always subsonic. The fastest shot using the Aguila Super Extra SE Subsonic ammo was 1,060 feet per second…which is subsonic in most reasonable temperatures and altitudes. The extreme spread and the standard deviation numbers on the Gemtech ammo seem to give it an edge. 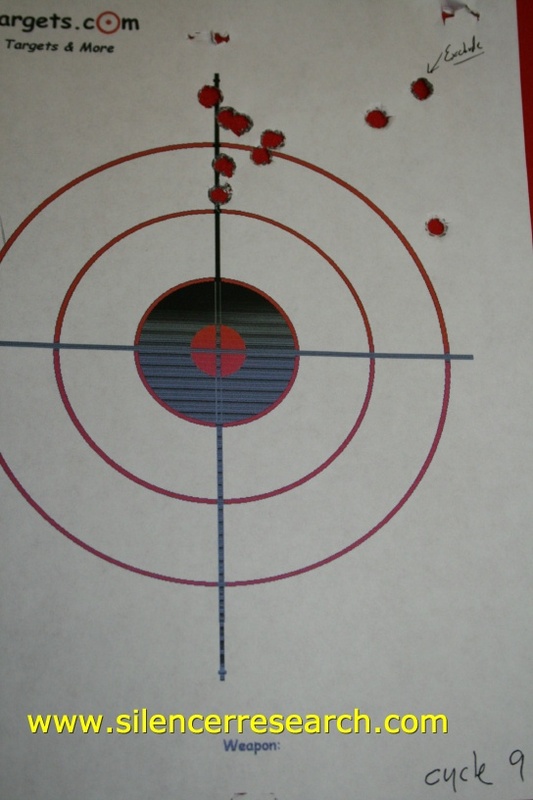 So we tested accuracy at my preferred 22LR sighting in distance of 40 yards. I hunt squirrels in the Ouachita Mountains with my suppressed 22 rifles, and that range gives me the best possibility of hitting my quarry in the head at the distances I typically encounter them. Keep in mind the accuracy tests were conducted using only a simple range bag, I don’t have ready access to a machine rest so the accuracy tests are subjective to the shooter. The silencer used for these tests was the XCaliber Genesis. 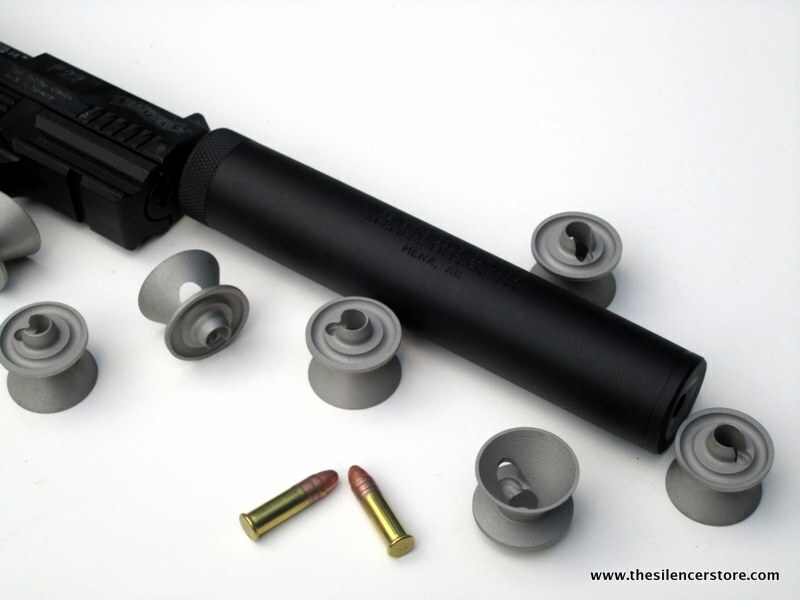 It has proven itself as one of the quietest, most affordable silencers available today. It is available in aluminum or all stainless and offers tremendous sound reduction on any platform. 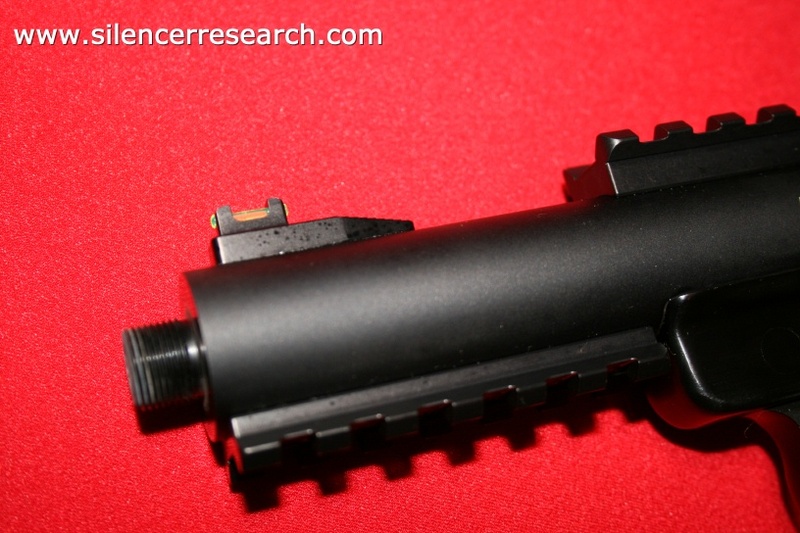 With virtually no first round pop on a pistol, testing with this silencer removes many of the testing variables that are prevalent in other designs. We create videos so that you can hear what these silencer tests sound like. While video is not the best representation of what a silencer will sound like when you shoot it at your location, it’s better than not having any video at all. These videos are all available at YouTube. So does the Gemtech Silencer Subsonic 42 grain ammo live up to its reputation? It does hit slightly harder, it IS more consistent statistically speaking and as for cleaner burning..we will test that claim on another day. 22LR ammo is traditionally pretty filthy so that will be a fun test. The only concerns I have with the Gemtech Silencer Subsonic ammo is that the cost is $ 4.95 per box of 50 and CCI is $6.33 per box of 100 at Cheaper Than Dirt. The packaging is not up to the cost, as I typically use empty CCI plastic boxes to hold the ammunition for easy loading. This ammunition was not marketed and produced to provide cheap, bulk pack Wal-Mart plinking and the testing shows that it’s better than CCI Standard Velocity when tested for consistency shot to shot. Is it worth the extra price?? I am glad that a major silencer manufacturer is finally offering ammunition like this, as this was an industry first, but the price is not commensurate with the performance. Pesky Bolt Noise…can I get rid of it? 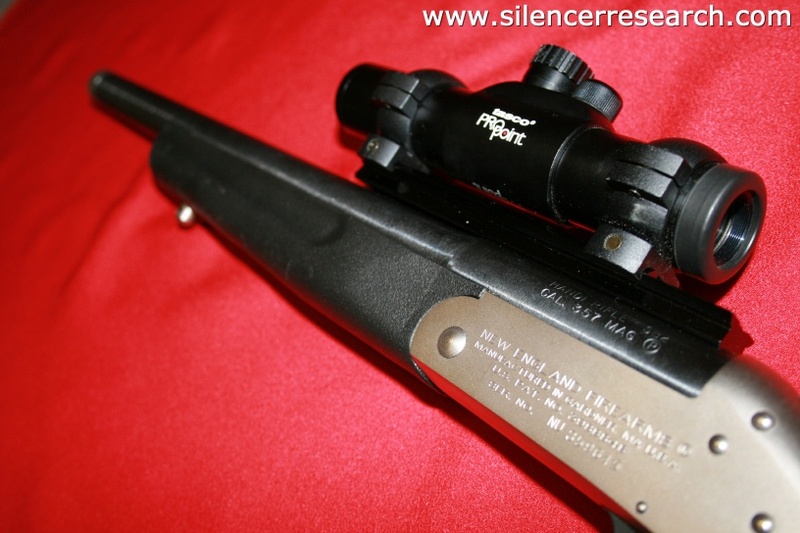 Ever wanted a really quiet shot out of your Ruger 10/22 when using your favorite silencer? We all have shot a suppressed semi-automatic 10/22 and thought…”Hey, all you can hear is the bolt noise!” So it becomes a natural thought to take that sound out of the equation too. Most guys just put a stout thumb behind the bolt while cradling the weapon from underneath, but that seldom works, nor does it help with accuracy. 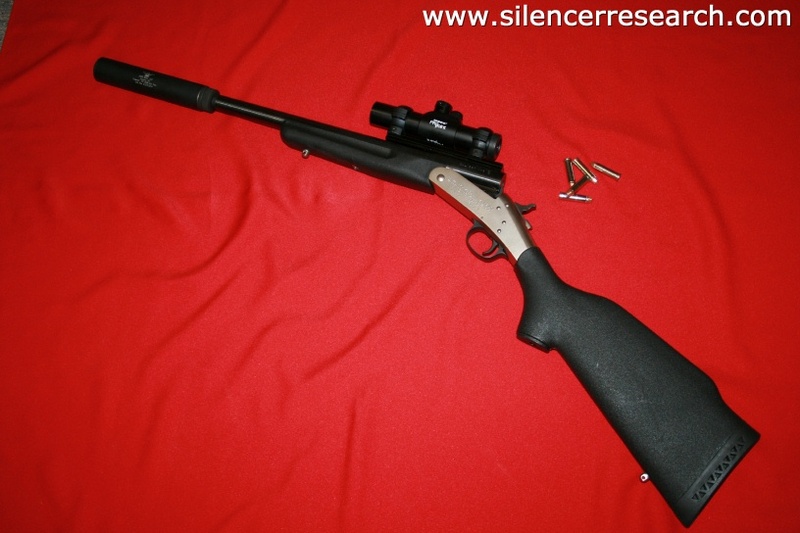 Bolt action suppressed 22LR’s are super quiet, so its logical to want to get that sound level, but still have the semi automatic option in the same gun. We all want the best of both worlds! 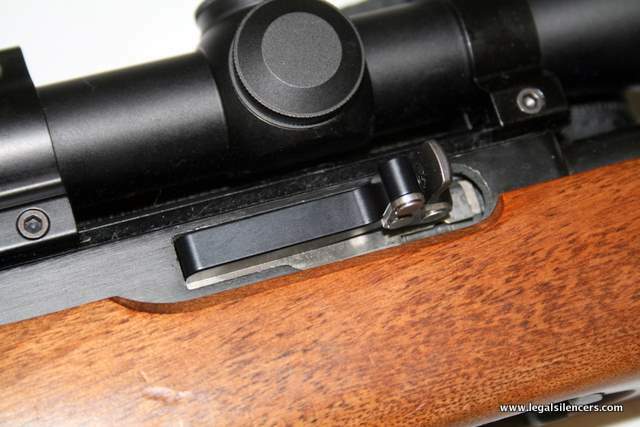 Enter the Colossic Bolt Lock for the Ruger 10/22. 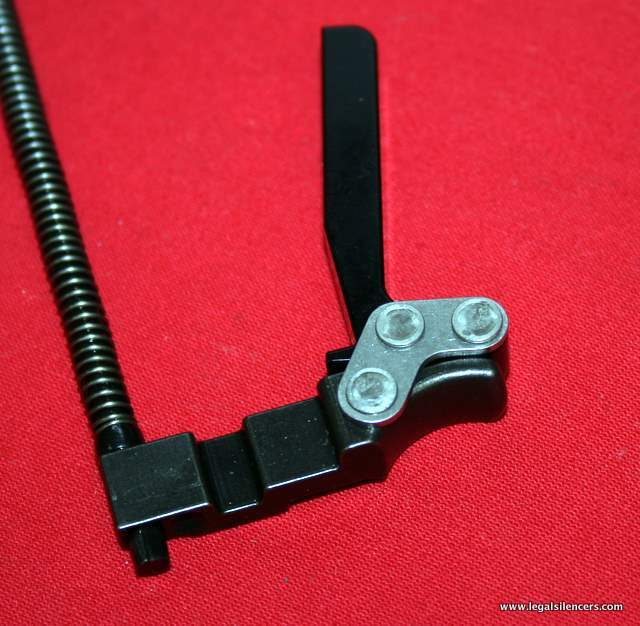 It’s a replacement charging handle for the famous Ruger 10/22 carbine. 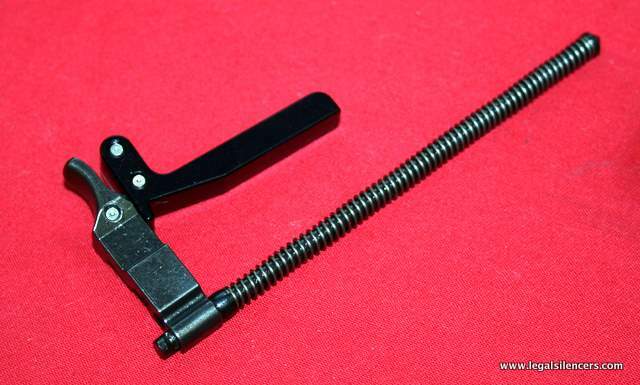 All you do is replace your current charging handle with the replacement from Colossic. The procedure takes about 5 minutes. The Colossic Bolt Lock weighs in at only 1.2 ounces while the standard factory charging handle weighs .85 ounces. 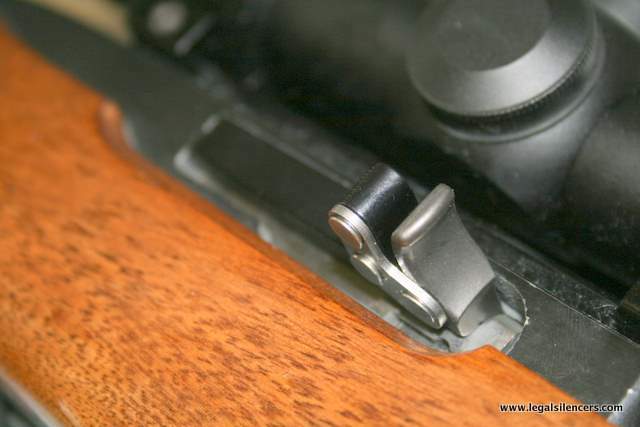 Anyone familiar with the fine intricacies of making a semi auto 22LR work, knows that such minor changes can affect the function of the rifle. 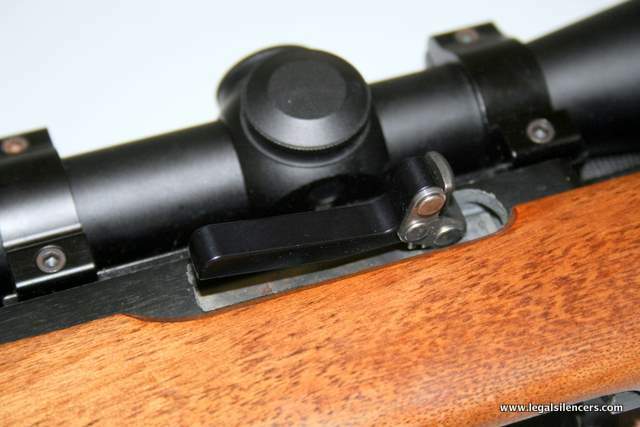 Our testing showed no problems with the function of the rifle using the bolt lock. There are two aspects we need to test on any bolt lock system. First we need to see if it really makes the suppressed gunshot any quieter. Next we need to see if point of impact shift is changed by engaging the lock system. If we cannot be accurate with and without the bolt lock, it doesn’t really become a truly useful device. Utilizing two in-calibration Bruel and Kjaer 2209 sound pressure level meters and the protocols set forth in MIL STD 1474D, we tested at the reference location and at the left ear location. This is correct MIL STD testing using correct equipment. I first tested bolt drop noise with a series of 15 bolt drops. This was done without ammunition in the magazine, so its slightly louder than when the weapon actually chambers a round, but the difference is insignificant. We then fired the weapon using CCI Standard Velocity WITHOUT using the bolt lock. The final test was with the bolt lock engaged for each shot. Ten shots were used for each of the live fire tests. As you can see from the results, the bolt lock system didn’t really didn’t make any significant changes in the sound pressure levels recored by the impulse sound meters. Technically speaking for the human ear to detect a difference between sound pressure levels, at least one dB is required. However, sound pressure meters don’t always predict how a gunshot sounds in real life. I could detect a slight difference when I performed the tests with the bolt lock engaged. 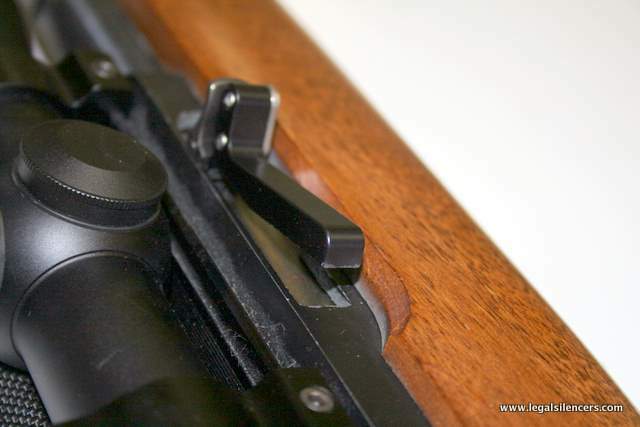 Also I use a rubber/composite bolt buffer in my Ruger 10/22 to soften the metal to metal contact when the bolt flies rearward to dampen that sound. Next up was accuracy testing. I tested the suppressed, non-locked system at 30 yards and then engaged the system to lock the bolt for each shot. The group was not changed enough to warrant adjusting zero between modes. 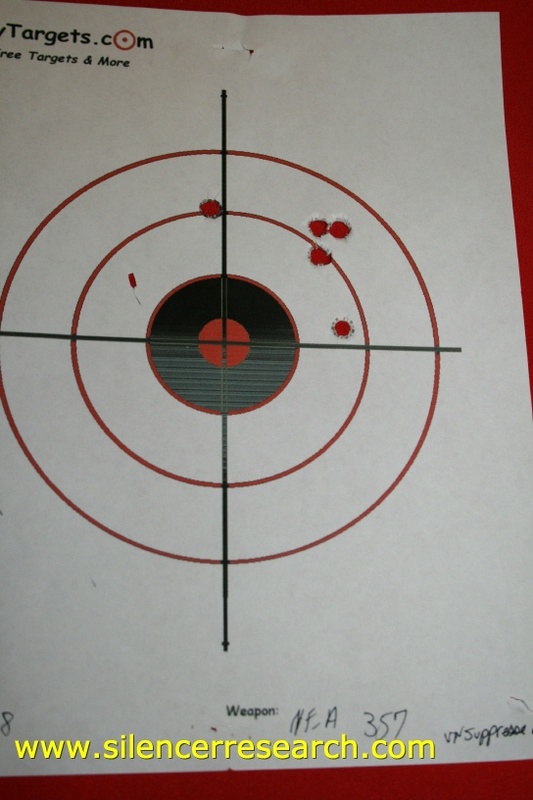 When I tested at 100 yards, the impact shifted about 1.5 inches to the left when the lock was engaged, but people seldom shoot 22LR at 1o0 yards so, point of impact shift was really not an issue. 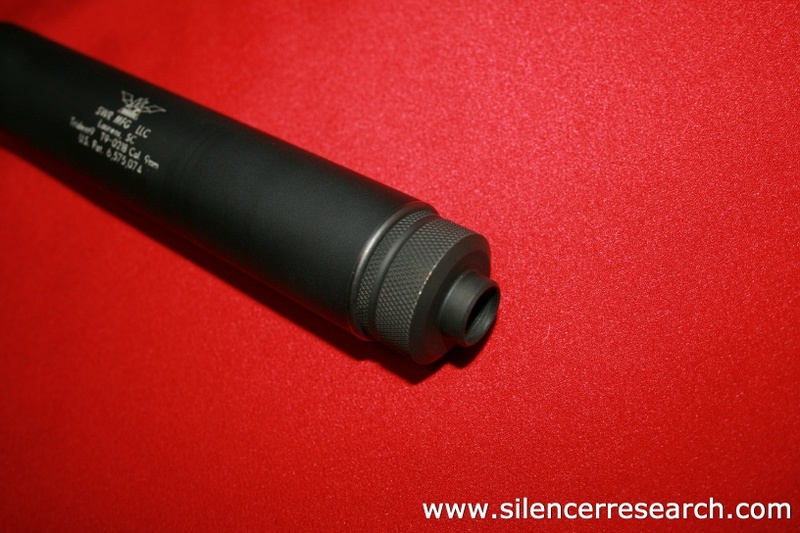 For this test we used the XCaliber Genesis silencer. 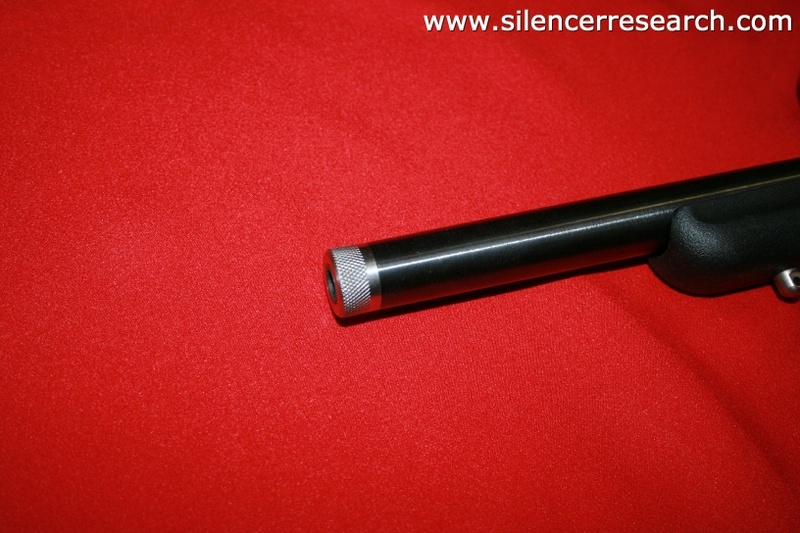 It is one of the quietest, most affordable 22LR silencer available today and can be obtained from your local class 3 dealer or online at www.thesilencerstore.com. The Genesis is a K baffle silencer that comes apart for cleaning by the end user and offers virtually no first round pop when used on a pistol. 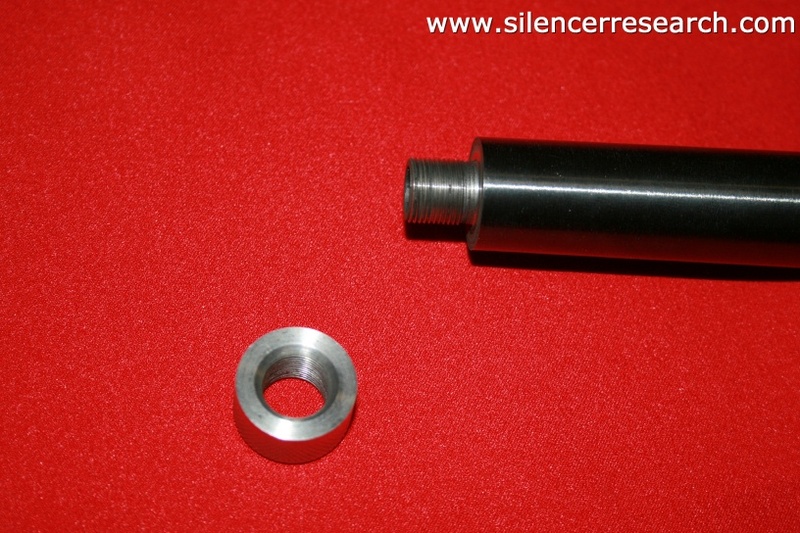 The Silencer Store also offers AR15 spacers, Walther P22 adapters, 308 Adapters, silencer pouches and much more. We hope you enjoyed the review and will check back for more reviews in the future. On November 18, 2007 I tested a New England Firearms Handi Rifle chambered in 357 Magnum with four 9MM silencers. The weapons barrel has been shortened to 16.1 inches and threaded to accept the silencers using the 1/2X28 TPI threading. In this review we tested some hand loaded 180 grain jacketed hollow points. The weapon is 31.5 inches long and weighs 6lbs 10 ounces. Here are some pictures of the weapon. The ammunition tested was 180 grain jacketed hollow points. These should prove devastating on deer and coyotes. Each shot, both suppressed and unsuppressed were recorded with a chronograph. Sometimes the chronograph gives me errors, so not every shot in every case is collected. The tests were conducted using the B&K 2209 sound meter with a B&K 4136 microphone calibrated with the B&K 4220 Pistonphone. Calibration was checked after the tests to verify there were no shifts in calibration during the tests. All equipment has been certified and tested so that it can be traced back to the N.I.S.T standards. Click HERE for the equipment certification sheets. The meter and weapon are also placed in accordance with Mil-Std 1474D protocol. I first fired 5 shots to establish the unsuppressed level and then fired 10 shots with the silencer attached with each of the four silencers. The ammunition was at the same temperature as the outside air. The weather conditions were mostly cloudy with the temperature during the testing period ranged from 66.9 and 68 degrees. Humidity ranged between 74-76% and the barometer was steady at 1019Mbs. Elevation was 1,000 feet above sea level. For this test, I tested two 1.25 OD silencers and two 1.375OD silencers. The SRT Matrix M9, the AAC Evolution 9, the HTG Cycle 9 and the SWR Trident 9 were tested each with 10 shots. Accuracy was tested at 50 yards. I would like to note that the accuracy tests were more of an afterthought than a bench rest, sandbagged accuracy test. I was by no means trying to make every shot 100% perfect and was using a red dot sight. The accuracy tests still reveal some very interesting data. 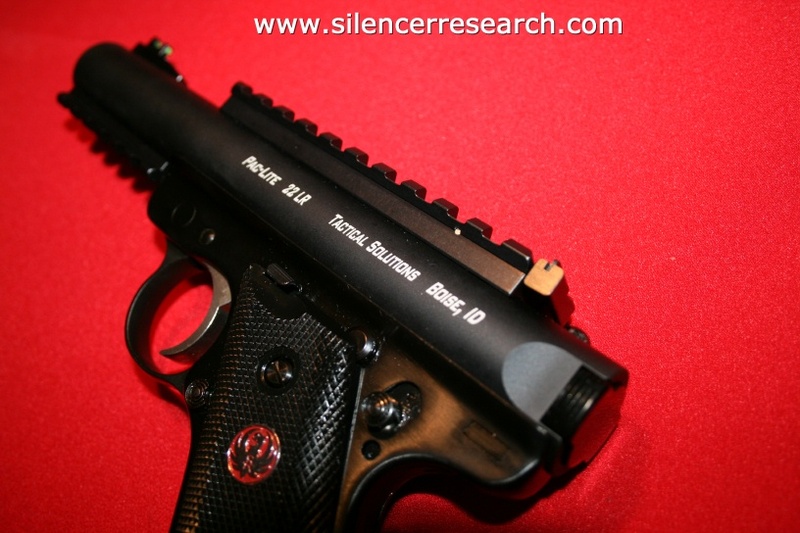 The SRT Matrix M9 was the shortest, lightest, and smallest silencer in this test. The SRT Matrix M9 weighs only 5.7 ounces and measures 6.375 inches long. 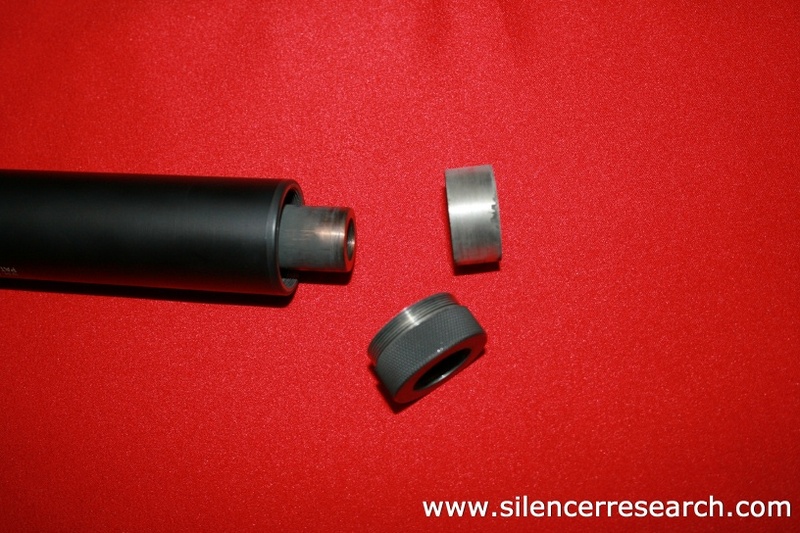 This silencer requires no fixed barrel spacer or thread mounts as the other silencer do. The AAC Evolution 9 is shown here next to a fixed barrel spacer that is available for this silencer. It allows the silencer to be used on AR15 carbines, fixed barrel pistols and weapons like the Handi rifle. The Evolution 9 weighs 9.7 ounces with the fixed barrel spacer and measures 7.5 inches in length. The HTG Cycle 9 can be utilized with a fixed barrel spacer much as the AAC Evolution 9. 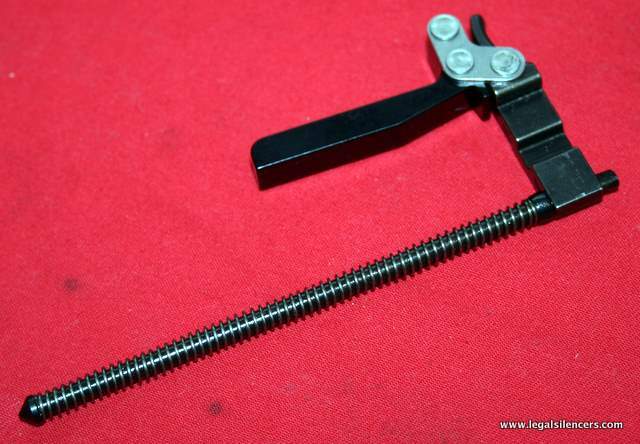 The spacer replaces the spring for use with fixed barrel weapons. The HTG Cycle 9 weighs 11.25 ounces and is 7.75 inches long. The SWR Trident 9 has a new thread mount that replaces the older style model. The newer mount is heavier and in knurled for easy swapping of mounting options. The old mount required use of a separate tool to change out the mounts. The older mount also meters over 4dB louder than the newer mount on this weapon. The SWR Trident 9 weighs 11.20 ounces and is 7.5 inches long with the thread mount. The SRT Matrix M9 and the SWR Trident 9 did very well. With the exclusion of two flyers (bad shooting on my part) the HTG Cycle 9 produced the tightest groups. The AAC Evolution 9 performed poorly in this test. Most of the rounds missed the target. I have no explanation for this at this time, since I have not worked on accuracy issues yet. These tests do show an obvious point of impact change when the silencer is attached and therefore one should sight the weapon in with the suppressor attached and use that zero rather than the unsuppressed zero. 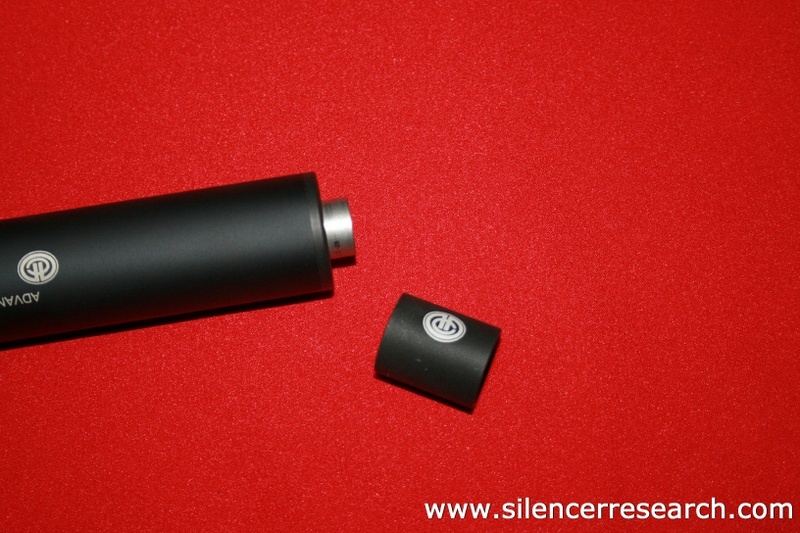 Two really good silencers emerge from this test when all things are considered. If you want the quietest silencer coupled with excellent accuracy, the SWR Trident 9 is the winner. However, if you are willing to give up some sound reduction for size and weight (important when carrying a rifle all day) the SRT Matrix M9 is the best choice. I think that this little weapon would make a great close range deer rifle. On April 1, 2007, I did an extensive review of the Ruger 10/22 with the Norrell integral silencer. I tested 5 types of high velocity ammunition for both dB and ballistics/velocity. Here is a picture of the weapon. 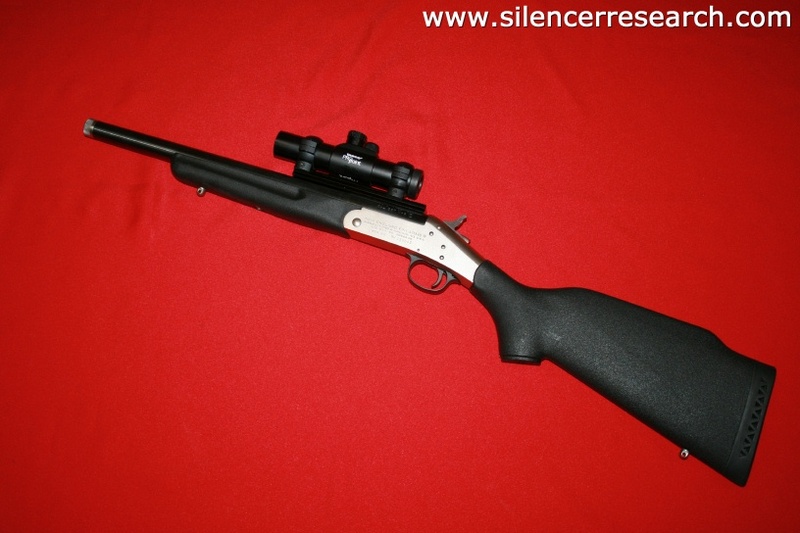 This is a stainless steel factory 10/22 with the silencer built over the factory barrel. The weapons overall length is 38 inches with an aftermarket rubber Hogue Overmold stock. It weighs 6 pounds 8.8 ounces (with the factory plastic stock it weighs 6 pounds 4.3 ounces. The scope is a Leupold VX 1 2-7X 28 Rimfire Speical. The parallax correction is set at 60 yards so you can focus on targets much closer than a scope that is not set up for rimfire. The base and rings are Leupold as well. 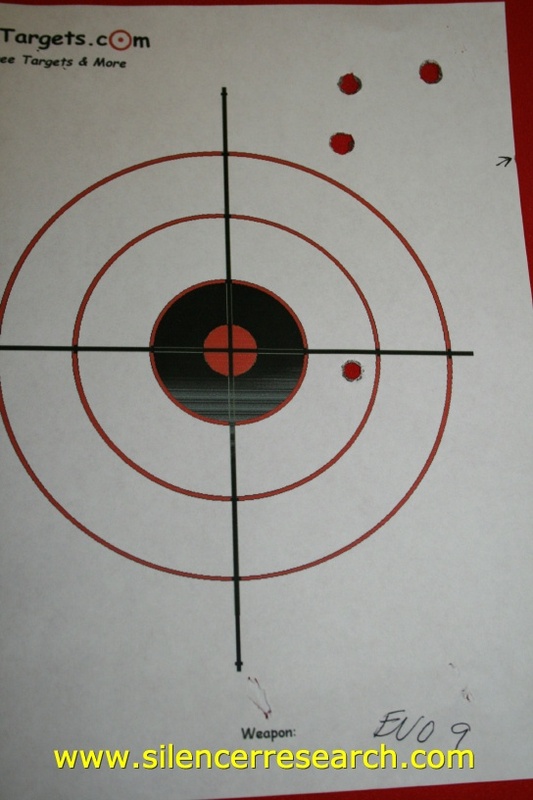 The crosshairs are a very fine set of crosshairs, so refined shooting is possible. The outer diameter of the Norrell silencer is right at one inch with an overall length of 18 and 15/16th. 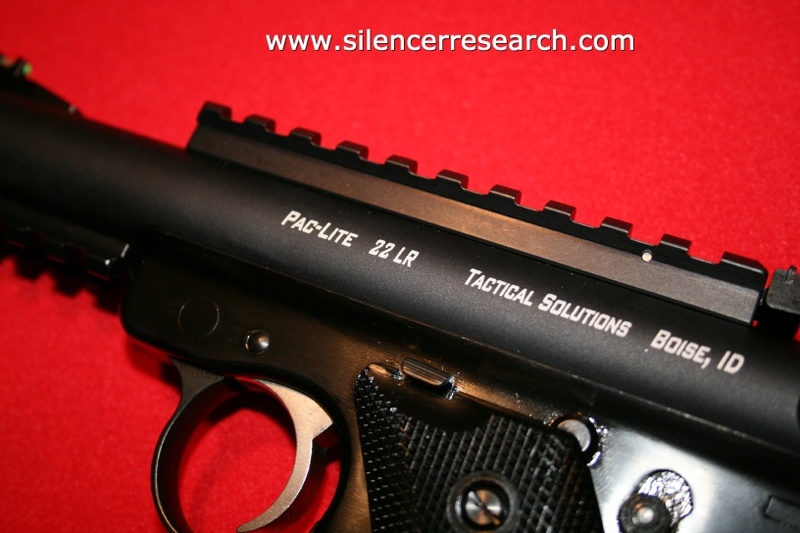 Integral silencers are different than muzzle silencers as integral silencers “live” on the weapon for life. There are advantages and disadvantages to both systems. 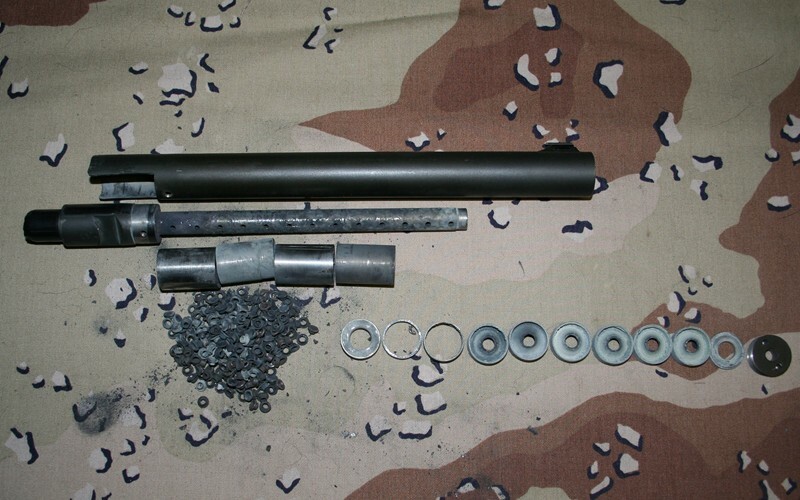 Here is a picture of a Norrell 10/22 system disassembled into its component groups. This particular picture shows what is know as a “shorty.” This is a shorter barrel, but the concept remains the same. These shorter barrels require a registered machine gun system in the weapon or the receiver must be registered as a short barreled rifle. The silencer is constructed so that the powder gas does not touch the outer registered tube, instead liners are utilized to keep this mess from touching the registered portion. Holes are drilled into the barrel to bleed gas off of the exiting bullet in order to drop the velocities to below the sound barrier. High velocity 40 grain ammo is recommended by the manufacturer. This helps keep velocities up and acceptable for shooting live game as well as providing the 10/22 action and bolt enough power to work reliably without altering the factory setup. The manufacturer provides a takedown tool that the end user can purchase and use to facilitate the cleaning procedure. This tool makes cleaning the silencer much easier and does not allow the external registered tube to become damaged. The tests were conducted using the B&K 2209 sound meter with a B&K 4136 microphone calibrated with the B&K 4220 Pistonphone. All equipment has been certified and tested so that it can be traced back to the N.I.S.T standards. The meter and weapon are also placed in accordance with Mil-Std 1474D protocol. The Ruger 10/22 with the Norrell integral suppressor was fitted with an Eagle 30 round magazine and 15 rounds were loaded of each ammunition type tested. Ballistics were taken by a chronograph. There is no way to test an integral upper for an unsuppressed reading. I tested 2 boxes of CCI Minimags (the recommended ammunition for this weapon as per the manufacturer) as well as PMC Zapper, Federal 40 grain Game Shok, and Remington “Golden Bullet” 40 grain rounds. I have fired pretty close to 12,000 rounds of this ammunition type through this suppressor. The ammunition produces very consistent velocities and seldom causes any cycling problems. I loaded an Eagle 30 round plastic magazine with 15 rounds and fired the weapon to test for dB levels as well as the velocities. 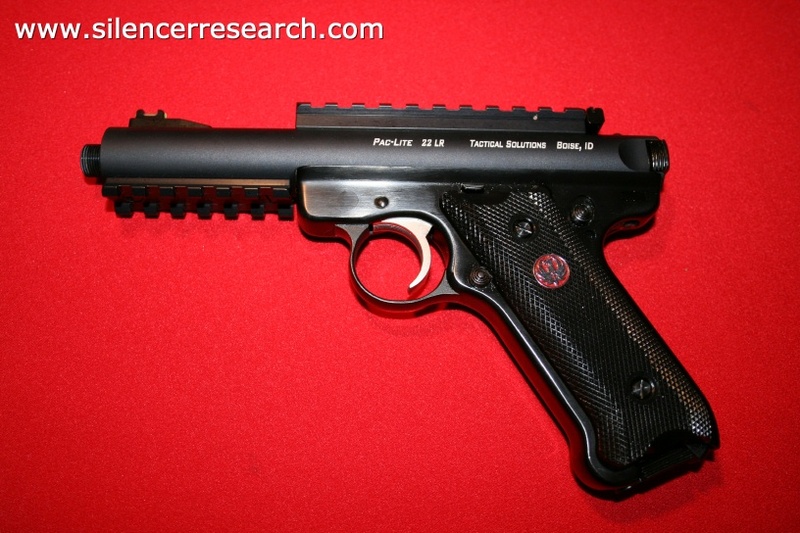 There is no way to test an integral suppressor unsuppressed, so I am unable to provide a dB reduction level. However, as cross reference, the a previous test of the unsuppressed 10/22 with CCI Minimags was 142.1dB. The average dB reading was 111.7dB and the velocities averaged 968 feet per second. The suppressed range was 110.5 to 113dB. 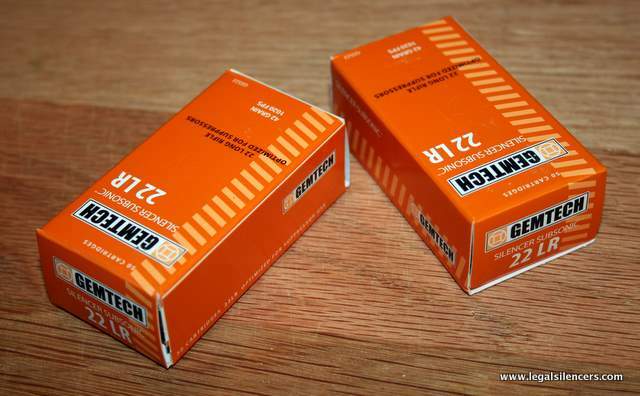 CCI recently changed the color of the packaging of its 22LR ammo. In doing this, I thought that perhaps the ammunition itself had changed. After several conversations with the company I was assured that no changes were made. I did experience some inconsistencies (such as ejection port bark, a larger variation if FPS, etc…) with the newer ammunition in my full auto 22 M16 Ceiner kit. If anything transpires further regarding this ammunition, I will keep everyone posted. These CCI Minimags produced an average of 111.1dB and the velocities averaged 968 feet per second. 109-113.5 was the dB range. PMC Zapper is not a recommended ammunition by the manufacturer, but is included for comparison testing purposes. The average dB reading was 111.2dB with the average velocities coming in at 1005 feet per second. The ammo tested well and was faster than the CCI Minimags. The dB range was 110-112dB so it was as quiet as the other ammunition types. I had one round to fly over 1050fps, and that can enter the trans-sonic danger zone at higher altitudes and in different weather conditions. Federal Game Shok was tested in the Norrell system for comparison purposes and is not recommended in the users manual. The average db level was 111.7dB and the average velocities were 986 feet per second. The dB range was 110.5 to 113.5dB. The same parent company owns Federal AND CCI, so it’s highly probable that both the CCI and the Federal 22LR ammo are produced with much the same components. The both come in a clear box and the ammo (except for the head stamp) look identical. This ammunition is NOT to be confused with the bulk pack ammunition sold by the 550 pack “bricks” in Wal-Mart. This is 40 grain high velocity solid point, not 36 grain hollow points. The manufacturer does not recommend using “promotional” ammunition like the 36 grain high velocity plinking ammo. It varies too much to be reliable. I have shot some of the promotional ammo and had 100-135fps variations. That is beyond the 90fps specifications that are set forth by SAMMI for 22 Long Rifle ammunition. The Remington Golden Bullet 40 grain ammo produced an average dB level of 111.8 dB and produced average velocities of 1001 feet per second. I measured bolt drop on the Norrell 10/22 for comparisons sake and found that an average of 5 bolt drops on an empty chamber resulted in an average of 111.5dB. I am awaiting a 10/22 bolt lock device that holds the bolt closed mechanically. When this device arrives, I will be able to test the Norrell system without the interference of the bolt and will post those results.